Until recently, if you wanted to buy a truly high-quality knife in New Orleans you had to go online. About four months ago, Coutelier NOLA opened at 8239 Oak St., and dramatically increased the options available. Knives, for those of us who use them all the time, are a very personal thing, and being able to hold one before purchasing is important. Chefs Jacqueline Blanchard and Brandt Cox are the folks behind the shop, and it’s the first job either has had outside of the kitchen. Their aim is to sell to professionals as well as home-cooks, and they plan to host pop-up dinners in the long, narrow space when they get the time. The knives are Japanese, which tend to be slimmer than Western knives, and generally have single-bevel edges. Most of the knives at Coutelier NOLA, however, can be sharpened with a more typically European, double-beveled edge, either 70/30 or 50/50. They also offer sharpening, with at most a 24-hour turnaround. Prices range from the affordable (an eight-inch chef’s knife by a company called MAC for under $100, to the expensive, for blades from a single maker. 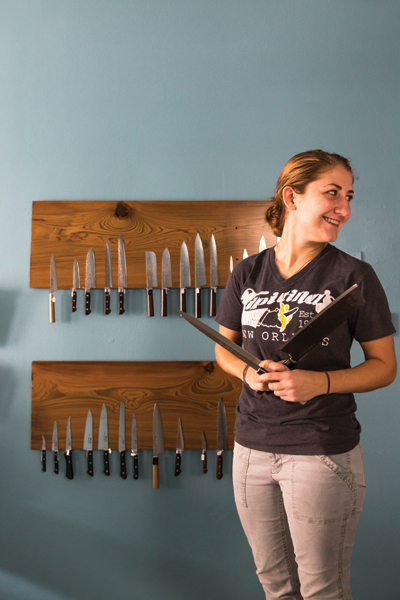 Cox and Blanchard (which sounds like an accounting firm, now that I consider it) have plans to host classes on knife skills and sharpening, and they also have an expanding assortment of kitchen tools and local products like cutting boards, sea salt and spices. Call 475-5606 for more information. Tchoupitoulas Beer Garden takes over the space that was formerly Bouche, a high-end wine and cigar bar. The two operations are very different; where Bouche strove for elegance, Tchoupitoulas Beer Garden aims for a more casual vibe. At the entrance, there’s a booth where you can buy tokens to use for beer and food, though the main bar also accepts cash. Draft beer is the focus here, and both local (NOLA Brewing, Covington Brewhouse, Bayou Teche), national (Goose Island, Destihl, Wasatch) and import (Ayinger, Weihenstephan) brews are available. It is a well-curated list, though as in all things alcohol, I defer to my colleague Tim McNally for the final word. There is food, too, and as you’d expect for a place that calls itself a beer garden, sausages are on the menu. In addition, there’s a German-style goulash, flatbreads with various toppings, fries and a few other choices. Tchoupitoulas Beer Garden is located at 840 Tchoupitoulas St., Suite 103, and it’s open Mondays-Thursdays, 4 p.m. until midnight, and Fridays-Saturdays, 11 a.m.-1 a.m. For more information, visit TBGNola.com. Dickie Brennan’s Palace Café reopened in October after a significant renovation. The most obvious change to the interior is the addition of the “Black Duck” bar on the second floor. It is the first thing you see when you climb the winding central stairway from the first floor dining room. 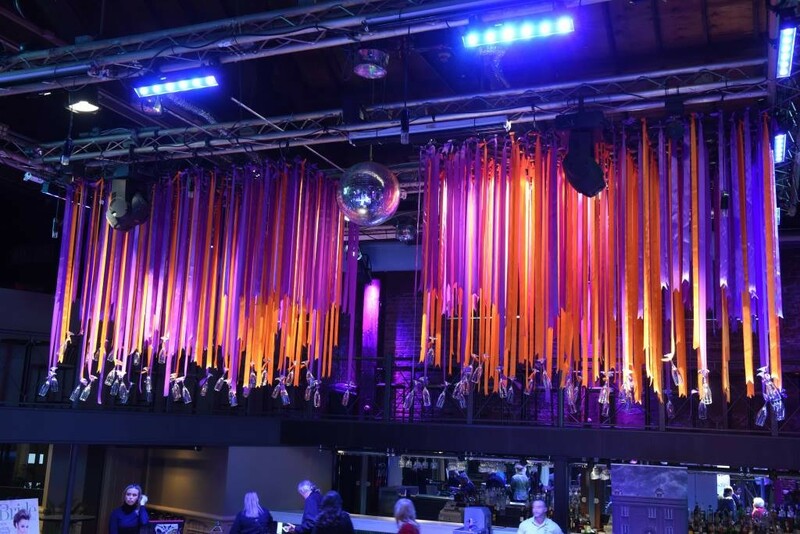 The brightly lit bar is located along the back wall, with low tables in front and to the side, where there’s also a large, flat-screen television. The bar specializes in rum, of which there are dozens, and tequilas. The renovation didn’t change the essential makeup of Palace Café or its menu; chances are good that if there was a dish you liked, it’s still available. One thing that’s new is the “shared” section of the menu. It is the work of French Master chef Rene Bajeux, and there are three basic options: cheese, charcuterie and the “Fruits de Mer.” All three shared items come with seasonal pickles, mostarda, chutney, mustard and Bellegarde bread. Bajeux is not the only notable chef to have joined Dickie Brennan’s team; chefs Gunter Preuss and Greg Sonnier are also on board, though not in as direct a role at Palace Café. Palace Café is located at 605 Canal St. and is open for Breakfast Mondays-Fridays, 8 -11 a.m., for lunch 11:30 a.m.-2:30 p.m. and for dinner nightly from 5:30 p.m. until closing. On Saturdays and Sundays there’s a brunch 10:30 a.m.-2:30 p.m. You can call 523-1661 to make a reservation.